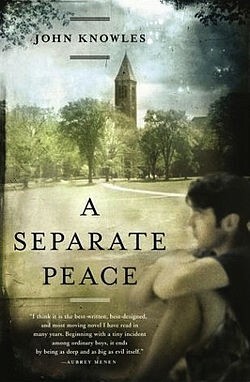 In the book a Separate Peace by John Knowles competition plays an important role in the friendship between Gene and Finny. Competition effects their relationship between Gene and Finny in a negative way. This is because competition causes misunderstanding between the friends and also rivalry. However Gene competes with Finny while Finny never purposefully competes with Gene. Gene is the one that has a problem with accepting that Finny is better than him. In the book a Separate Peace by John Knowles competition plays an important role in the friendship between Gene and Finny. Competition effects their relationship in a negative way. Definition of competition: The act of seeking or endeavoring to gain what another is endeavoring to gain at the same time; common strife for the same objects; strife for superiority in contest; rivalry, as for probation, for a prize or as where two or more persons are engaged in the same business and each seeking patronage; followed by for before the object sought and with the person or thing compared with. Also, the activity or condition of competing, or an event or contest which people compete. In this book competition has a negative effect on the friendship between Gene and Finny. These quotes will show that Gene and Finny's relationship was never a competition for Finny; just a friendship, whereas for Gene their whole relationship was competitive. This quote was stated after Finny fell out of the tree and broke his leg and a bunch of boys are together playing betting card games. This quote is important because it shows the losing battle Finny in now in, that battle is his life. This quote really shows the effect the accident had on Finny and how he is so different than he used to be; losing everything. This untimely pleases Gene, the fact that Finny lost something to him, excites Gene to know that he is for once above or beating Phineas. This quote shows the pressure Gene feels from Finny. Gene is so stuck in the competition of their friendship he would jump out of a tree not to lose. This also is a perfect example of the definition of competition, the definition states "the act of seeking or endeavoring to gain what another is endeavoring to gain" this is what is happening in the quote with Gene, he is seeking to be as great as Finny which is why he would never miss a meeting or not jump out of the tree, even if he really didn't want to. Gene didn't want to lose to Finny. This shows Gene trying to make sense of his relationship with Finny and Gene also trying to prove to himself that he is on the same level as Finny. Gene is feeling jealousy and hatred towards his best friend and he wants to make sense of that. This quote shows that he wants to be even with Finny so bad. He compares Finny athletes to his academics. Later in this passage Gene begins to blame Finny for many things saying that their whole friendship was a scam because Gene in thinking that all Finny ever wanted out of their relationship was to be better than Gene. Gene comes to the conclusion once again that they are "...even in enmity." This quote is later proven to be false in the book. When Finny tells Gene to stay in the room one night so he can continue to do well. This act that Finny does on page 58 and 59, Finny shows great character by telling Gene that if he had his kind of brains he would "cut it open so people could look at it" he says that even if he studied all day he could never do as well as Gene does. Finny also tells Gene that if he is really good at something he should be serious about it. This all shows that this quote from Gene is not true at all, Finny did not think of there friendship as a rivalry but Gene did. Gene thought of his relationship with Finny was a competition, Gene had always believed that, however it was not a mutual feeling. This competition that Gene feels with Finny cause rivalry and misunderstanding between the fiends.